Design process for assessing potential and possible hazards for integrating life to another planet. Create paper on the ethics and potential dangers of landing any vehicles and especially human visitation of planets. The danger of inoculating life forms in the open environment on another planet. An international conference and summit should be conducted to deal with rights and uses, and provide a legal framework to coordinate future endeavors in space. Procedures for hazardous processes identification should be specified for all future space-exploration. This should be drawn as an international code of law and specify for all exploration and planetary environments. The question of whether the introduction of life will permanently poison a planet, rendering its environment uninhabitable must be thoroughly addressed. There are trillions of micro-organisms traveling with people: Humans = Bag of Bugs. Slime mold and penicillin are among the most robust life-forms, many of which are extraordinarily hard to eliminate from equipment and pose a nearly impossible job of abating. Slime organisms, as an example, are so pervasive, forms are found in deep caves, - are sulfur based, and need no sunlight. The many organisms we may bring, may allow a few to form a supporting cycle of life. If we go to Mars, there will be an absolute, 100% result. The many possibilities need to be examined under the full scrutiny of the scientific community. This proposed Hazard ID Project is paramount, wholly necessary preparatory work and not small. It needs to be an international effort. The importance of doing such a project needs to be communicated and considered by the wider science community. Procedures for hazardous processes identification will need to be specified under international treaty for all future space-exploration where it must be seen that each environment is unique and needs to be uniquely assessed. At the present time, inquiries for endeavors on this subject finds people pressing forward on their various projects without any apparent concern nor even notion of this problem. If we go to Mars and turn it into a poison-pit, that would not be good. The future should then inquire as to the nature of those supposed of expertise. Articulate the Over-all Operations Protocol to define all parameters including financing by member states and corporations. Mars station, living, working, energy - and purpose/products project proposal, including mining and sciences. Design overall Mars Development Project. Create purpose statement. Articulate contracts of ownership and licensing for lands, products and materials to the corporation and investors. -Examine notion of Refueling and vehicle dump - /repair and retrofit station for general space activities support, midway between Earth and Mars. These could be multiple stations in wide Mars orbit. Pursue an expandable wide-orbit satellite station regime - where space observatories can be placed into a large linked array, for energy and communications transfer. -Create paper on materials acquisition and materials cargo transport. Include exploring feasibility for locations tied to the over-had linked array and ground tranport. -Do paper on inter-planetary transport of dangerous materials and the possibility of the stepped process of building a hazardous materials processing industry. Attached with mining operations the materials would provide a cleanly managed industrial waste clean-up. A pitch might be made to absorb and thereby clean the earth's nuclear dumps and waste sites while providing clean energy and advanced materials for both worlds. Earth to orbit system of aircraft towed orbiter-vehicles, transverse shipping, stationary satellites and lander vehicles. These will include a schematic of public and private companies and endeavors. Life support system includes self-sustaining septic, water and air to accommodate space vehicles and planetary installations. 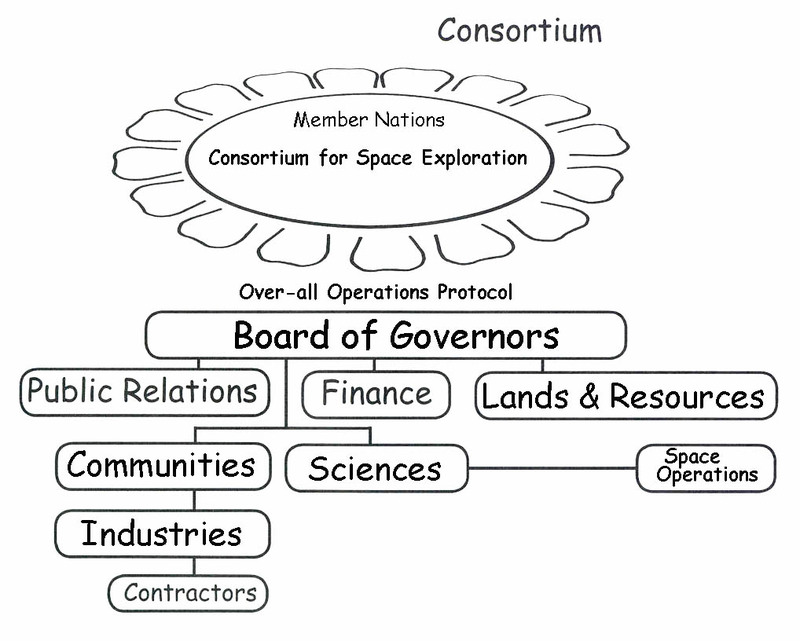 There shall be countervail schemes and systems in space-craft with rotating domiciles. One scheme could have certain outside functions arranged on movable panels, where sensor-driven computer logs dictate to panel positioning, a continuing operations off-set. Life support craft will be designed to accommodate and integrate with all uses including space vehicles, asteroid mining environments and planetary installations. All work stations can become future science laboratories. Plans will be constructed for science labs and multi-array observatories on Mars, or around the Mars orbiting descent and launch station, or around the mid travel-point fuels-dump space station. It will be necessary to build a materials processing and purification center for mining of planets, planetoids, asteroids and comets. There also needs to be a fuels storage depot. This evokes the necessity of beginning the process of designing large mid-travel point fuels station. The make-up of such a craft should follow the modular designs model so that multiple crafts can be built and added upon over time. Of course, large crafts must account the fragility of structures as mass builds. Any structure has a "critical mass" threshold or limit, and a fuels station structure will see a grossly changing mass index. This should be ameliorated to an extent by careful mass off-set design principles. The periodicity with which Earth passes closest to Mars allows us to think that numbers of large observatories attached to wide-orbit Mars orbital fuels dumps can place such stations, sequentially, in time with Earth to Mars travel. This would coincide with the normal travel-times corridor. These science stations would be convenient resource points, destinations and also far orbit departure platforms. It is possible, in the future, to design a Satellite array which might supply focused energy for surface power generation. Manufacturing is a prime focus for the first settlement. - Manufacturing, mining, machining and fabrication methods and systems are to be designed carefully. Design initial power station and utilities and integrate with Over-all Operations Protocol. Process for water supply. - Water treatment units that accompany spacecraft will be designed for use on the planet to integrate into a larger water-systems scheme to feed the various “life-domes”, structures and work-stations. There should be careful management of water colors, white, gray, black, etc. These would be treated in the garden corridors. [Check plant pistil/pollen reproductive systems and growth rate on low gravity.] This system needs to be dynamically integrated into the overall recycling regime and with the energy & power systems. Solar to Hydrogen and Oxygen are initial goals. erected. With elevators and trams. Create controlled centrifugal, integrated modular habitats design to accommodate space vehicles and planetary installations. 1): Design three sizes of centrifugal-force ring living environments. These should all be designed for multiple modular configurations as needed. These can be permanent, fully integrated space craft that land and remain as planetary domiciles. They can be moved and become space-craft again. Also design hexagonal cells, or other geometries for modular units that can be disengaged from their Earth-to-Mars vehicle, be transported by shuttle to the surface and then stack and ride in carrousels on a circular track or around the center access hub. Gondolas transport to and from living quarters to the center hub where people descend or ascend from tram tunnels under ground. Permanent life-domes could be a covered carrousel of the hex living quarters that were the living quarters in the spacecraft and ride inside each dome as a carrousel to create a faux-gravity - having had the same function on the inter-planetary spacecraft. These should be designed such that smaller domes could eventually become much larger units to take best advantage of mass for a flywheel effect. Figure angle of flooring to carrousels diameter for best weight to speed false-gravity effect. Life-domes should covered with a skin that provides solar power and insulation. This could be a layered net. Viewing decks can be integrated. Multiple and heavy-use, gravity units are, of course, separate from normal living quarters and must be so designed. There should be trams that connect life-domes. These corridors will be modular and will also provide gardens and utilities runs for the modular and expandable recirculation life support system. Longer term: Examine the potential viability through all systems and design ramifications for producing cave, solid rock installations, stone structures, and production of Martian concrete with cure methodologies. Concrete and fiber matrix composites. 1): It may be necessary to have cameras in every area. If so, personal privacy must be maintained where the system is not hackable but emergency protocols allow various and defined access. Therefore, it also might be advisable to think about personal chip identifiers. Among the many other systems uses of personal identifiers, video logs could be defined under stern contract to allow anyone legal rights and open access to any camera logs that they have been a part of in any area of the ship or installation. This disallows abuse. Personal interactions then can then also be relegated to specially exempted closed access rights - where a given interaction can only be accessed by agreement and consent of the parties involved. Personal identifiers and an applied code of use may, in fact become a completely necessary and normal aspect to space travel. These systems can be integrated with craft maintenance sensor systems. 2): Develop my wall-screens invention such that whole wall-areas in space craft and living quarters can be interactive viewing and control screens. 3): Develop my power use system design that recirculates voltage potentials, as opposed to driving power voltages to grounds. Explore the notion of creating a vehicle-encompassing magnetic field that, once established, might absorb and sink power from the solar wind. The vehicle power rails, devices and systems, in such case, should then be designed as a fully integrated system. 4): Develop fully integrated, modular standardized, dynamic and redundant water, septic, food-production and air and gases recycling systems. 5): As the function of humans is to do things, what they do may have effects of consequence throughout the craft. There then should be plans to encompass all potentials through time. We wish to avoid a situation where someone didn't think about the overall or true displacement of mass in areas they were not focused on. So a system to define the states of distribution of materials, mass and momentum such that constant monitoring by computer, sets rules of behavior - is probably necessary. It may be advantageous to build isolated rotation rings - where changing weight activities can be kept controlled and isolated and not effect the craft as a whole. 6: One would think the 1% atmosphere of Mars would disallow lighter-than-air craft. However: analyze atmosphere make-up to lighter than carbon-dioxide gases toward possible dirigible designs. Engines can be assembled into configurations of two, three, four, five and six Vehicle Acceleration Rings. Skins shall be designed to absorb spurious charge and integrate to storage. Note - Possible finance goal: Investment monies are to go to the actual space project - not inflated salaries. Everyone will work for subsistence wage but own stock. Shares are divided by investment, either in monies or effort.